The powerhouse Grace Jarboe is an 11-year old natural-born fighter. 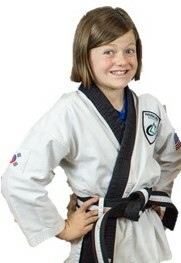 Yes, she just earned her 1st Degree Black Belt in June. Yes, she is currently a lacrosse and ice hockey player. And, yes, she fought cancer and won - but she did that when she was 4 years old. A conversation no parents wants to have with their pediatrician, Grace was diagnosed with Bilateral Wilms Tumor when she was two years, nine-months old. A form of kidney cancer, Grace went through treatments until she was four and continues with scans. Though she has since recovered, Grace was left with the use of only 80 percent of one kidney. St. Jude's Hospital was such an integral part of her journey, that when choosing a charity for the charitable giving portion of their Black Belt Training Cycle, the class elected to donate to the organization. "If it wasn't for St. Jude's I wouldn't be here," she said emphatically. So much happening when she was so young, Grace was ready to get involved in activities she could excel in when she was seven. Martial arts seemed a natural fit for her. "We first brought her to karate to help her learn self-control and leadership skills," explained Grace's mom, Karen. "She was confident, but we wanted to help her build self-esteem." Part of the self-esteem issues happened when Grace was cornered by "mean girls" at school when she was seven. "Some kids don't like that I stick up for myself or that I dress like a boy," Grace explained. "I have no care in the world about them." Her mom agreed with Grace's attitude. "You just have to be true to yourself," she said simply. However, while Grace doesn't care about her peers' attitudes, she continues to work hard to prove to herself. Going through the treatments when she was younger diminished the strength in her abdominal muscles and Grace always felt held back because of that. "She was very frustrated that she couldn't do sit-ups very well and was nervous she couldn't get a Black Belt because of it," said her mother. "I was nervous because I didn't want to fail," said Grace. She continued to work at the skill to build up her strength. She passed her Black Belt testing with no provisions. Her attitude can be summed up in one simple quote from Grace: "I'm not stopping - I'm going," said Grace. Rolando Perez, owner of the PBK school, said he had no doubts on Grace's abilities. "The one thing about Grace is you tell her how to do something, she says, 'yes, sir!'. Then, the next time you see her, she's got it down," he explained. "During Training Cycle, she was working hard, putting in extra effort." Grace continues to help the Rangers at class as she forges ahead towards her second degree. She is popular among the younger classmates. "Grace brightens up your day - every time you see her," said Perez. "She is always trying to make everyone happy."